Background: Rheumatic diseases have many outcomes, but less understood are many manifestations of additional health conditions that are associated with these diseases called co-morbidities. The more co-morbid illnesses one has, the greater the interference with medical management of rheumatic diseases. It is important to recognize such illnesses and to account for them in the care of the individual patient. There are few studies pertaining to different co-morbidities associated with rheumatic conditions. Therefore, this study was carried out to evaluate different rheumatic diseases and their frequency, associated co-morbid conditions and their variation based on age and body mass index (BMI). Methods: This cross sectional study was designed to survey 1000 consecutive patients who were diagnosed to have rheumatic diseases for co-morbidities at our institution. Patients of either gender with age ≥18 years were included. Data was collected regarding demographics detail, diagnosed disease and co-morbid condition. Analysis was done by IBM SPSS version 17.0 and R version 3.4, the association of rheumatic disease and co-morbidity with age and BMI was analyzed using Chi-square test. Results: We found that that rheumatic disease and co-morbidity increased significantly with age and body mass index (BMI) (P < 0.005). A substantial proportion of patients with rheumatic diseases (45%) were foud to have co-morbidities. The most common amongst them are hypertension, hypothyroidism and diabetes mellitus in descending order of frequency. Conclusion: C-morbidities which are amenable to therapeutic measures are common in individuals with rheumatic diseases. Early detection of such co-morbid condition is helpful should be an integral part of rheumatology patient care. Patients with rheumatic diseases (RD) are not only at high risk of developing comorbid disease, but also exhibit a high incidence of comorbidities.,, Patients with RD mostly suffer from at least one or more comorbid conditions and may be associated with persistent inflammatory activity or disease-related organ damage. These comorbidities can be related to RD itself or its treatment or completely independent of these. Lifestyle choice or physical inactivity can contribute to comorbidities., Comorbidities in RDs can impact primary disease in various ways; by affecting patient's quality of life and influence the effectiveness of treatment. Achieving remission and low disease activity may limit comorbidities commonly associated with RD. However, the risk–benefit ratio of striving to achieve such goals needs to be considered. Some of the common comorbidities associated with RD include anemia, osteoporosis, bacterial infection, lymphoma, gastrointestinal ulceration, myocardial infarction, heart failure, stroke, hypothyroidism, depression, fracture, skin cancer, and any cancer. Heart disease remains a major problem in patients with RD, and there is 50% increase in the risk of cardiovascular (CV) mortality in rheumatoid arthritis (RA) patients as compared to the general population. Young-onset RA patients suffer more frequently from RA-related comorbidities such as CV disease (CVD), chronic renal disease, and osteoporosis. According to the COMORA study, comorbidities associated with some of the RDs are depression (15%), asthma (6.6%), CV events (myocardial infarction and stroke, 6%), solid malignancies (excluding basal cell carcinoma, 4.5%), chronic obstructive pulmonary disease (3.5%), hypertension (11.2%), hyperglycemia (3.3%), and hyperlipidemia (8.3%). In addition, the frequency of metabolic syndrome is higher in RD patients compared to that of control group (39.8% vs. 20%). Summarizing the data from various studies carried out among RA patients in India, ≥30% of RA patients had anemia, dyslipidemia, leukocytosis, thrombocytosis, tuberculosis (TB) and infections of unknown organisms, and extra-articular manifestations ranging between 15% and 61%. In addition, more number of comorbidities in RD not only make the management more challenging, but also interfere with treatment and increase medical costs, disability, chance of hospitalization, and risk for mortality. Therefore, it is important to recognize such comorbidities and to take into account treat-to-target recommendations and achievable therapeutic goals with additional medications and frequent monitoring., Data regarding medical comorbidities associated with RD in previous studies are mainly from Western populations, and there is scarcity of data from the Indian population., Therefore, we conducted a cross-sectional study to focus on (i) different RDs diagnosed and the most frequent RD observed, (ii) different comorbid conditions associated with each of the RD, and (iii) variation among the comorbid conditions according to age and body mass index (BMI). In this cross-sectional study, consecutive patients attending Rheumatology Outpatient Department at Yashoda Hospital, Secunderabad, India, between June 1, 2016 and March 31, 2017, were studied for various RDs and associated comorbidities. Patients of either gender with age ≥18 years with a definite RD/musculoskeletal disorder (according to American College of Rheumatology guidelines) and can cooperate were included in the study. Patients who met the study criteria were interviewed by a physician and the information was entered into a computer. Patient interview consisted of demographic questions related to age, occupation, personal history (smoking, tobacco chewing, and alcohol consumption), family history of arthritis, existing comorbidities, drug allergies, and duration of RD. Each patient's height and weight were measured and BMI was calculated. In all patients, blood pressure (BP) was measured in the sitting posture by the physician using mercury sphygmomanometer. If the patient's BP was elevated, two additional measurements were done, waiting a few minutes between measurements. All these information was entered into database and was maintained for registry according to the unique hospital outpatient ID given to individual patient to avoid repetition of patient enrollment. Comorbidity was defined as the presence of coexisting or concomitant diseases or disorders co-occurring with RDs in our study. The comorbid conditions associated with RDs were included in patients' profile based on patients' previous reports. No tests were performed for diagnosing any naïve comorbidities. Data collected from the patients were imported into the Microsoft Excel database. To appraise the efficacy of this, a pilot study was carried out prior to the start of the study. Mean age of the population and significant age group having the highest percentage of comorbid condition and RD were analyzed. Analysis was done by IBM SPSS version 17.0 (Chicago, IL, SPSS Inc.) and R version 3.4, and the association of RD and comorbidity with age and BMI was analyzed using Chi-square test. Dichotomous outcomes were summarized using percentages and continuous data were presented as mean and standard deviation. Percentage of various comorbid conditions in each of the RD was calculated. The study was approved by the Ethics Committee of our institution, Yashoda Academy of Medical Education and Research. Informed written consent was obtained from all patients. This cross-sectional study included 1000 patients; of whom 188 were men and 812 were women in the ratio of 1:4. The mean age of the patients sampled was 44.78 years, total mean BMI was 25 (11–47) kg/m2, and the total mean duration of RD history was 3.62 years. Mean systolic BP and diastolic BP were 136.5 ± 6.7 and 83.2 ± 7.2 mmHg, respectively. The mean age, mean BMI, male:female ratio, and mean duration of illness for each set of patients with RA, spondyloarthritis (SpA), osteoarthritis (OA), and systemic lupus erythematosus (SLE) are mentioned in [Table 1]. In this cross-sectional study, we noted 18 different RDs; RA, SpA, OA, SLE, gouty arthritis, Sjogren's syndrome, mixed connective-tissue disease, osteoporosis, scleroderma, antiphospholipid antibody syndrome, rhupus syndrome, vasculitis, myositis, sarcoidosis, fibromyalgia, viral arthritis, and soft-tissue rheumatism. RA was present in the majority of patients (n = 493, 49.3%), followed by SpA (n = 224, 22.4%), OA (n = 165, 16.5%), and SLE (n = 91, 9.1%) among the study population. Among the 1000 patients with different RDs, 45% of the patients had one or more associated comorbidity as shown in [Table 2]. About 28.4% of patients had one, 13.3% had two, 3.0% had three, and the rest 0.2% had four comorbidities. 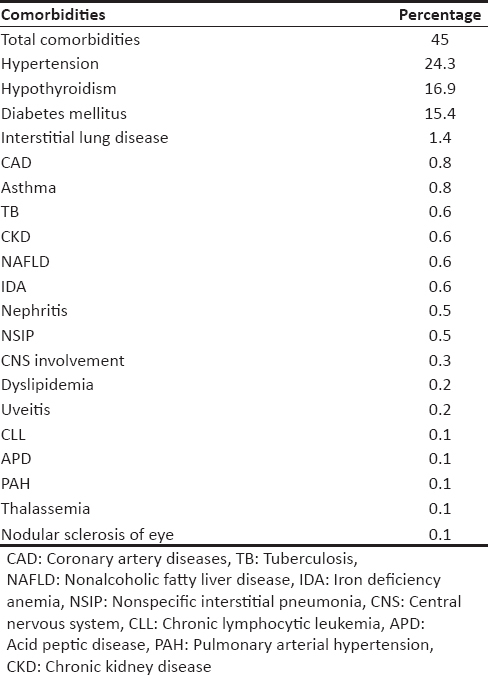 Among various comorbidities, hypertension was the most frequent (24.3%), followed by hypothyroidism (16.9%), diabetes mellitus (DM, 15.4%), interstitial lung disease (ILD, 1.9%), coronary artery disease (CAD, 0.8%), and asthma (0.8%) as shown in [Table 2]. Among the studied four age groups, RDs were frequently observed in the age group of 40–<60 (n = 488), followed by 20–<40 age group (n = 323) and ≥60 age group (n = 153). Comorbidities were observed more frequently in patients above <60 years (76.4%) followed by 40–<60 age group (50.2%) and 20–<40 age group (25%) as shown in [Figure 1]. Patients in the age group of <20 years showed the least incidence of RDs and associated comorbidities, whereas comorbidity increased significantly with age (P < 0.005). To find whether BMI was a significant factor in RDs and comorbidities, patients were categorized into four groups. RDs were frequently observed in the BMI group of 25–29.9 (36.1%), followed by 18.5–24.9 BMI group (35.1%) and ≥30 BMI group (20.6%). Comorbidities were observed more frequently in patients above ≥30 BMI (62.1%) followed by 25–29.9 BMI group (50.6%) and 18.5–24.9 BMI group (34.7%) as shown in [Figure 2]. Patients in the BMI group of <18.5 kg/m2 showed the least incidence of RDs and associated comorbidities. This indicated that comorbidity increased significantly with BMI (P < 0.005). [Table 3] shows the occurrence of various comorbidities in four major RDs, namely RA, SpA, OA, and SLE in the study population. This cross-sectional study was undertaken to add information to the limited data available on the incidence of comorbidities in RDs in India. In this study, among various RDs, the occurrence of RA was highest, followed by SpA, OA, and SLE. In one of the earlier studies, of 4800 patients suffering from RDs, attending Burdwan Medical College Hospital, West Bengal, India, soft-tissue rheumatism cases were maximum (57%), followed by OA cases (36%), RA (5.2%), rheumatic arthritis (0.4%), ankylosing spondylitis (0.6%), osteochondrosis (0.7%), and gouty arthritis (0.1). In a study carried out in Ogan State of Nigeria, among 472 rheumatological cases, 45.8% had degenerative arthritis and 4.9% had connective-tissue disease. Further, common rheumatic disorders were OA (28.8%), nonspecific low back pain (11.9%), cervical spondylosis (8.9%), lumbar spondylosis (8.1%), shoulder pain syndrome (7.6%), etc. In a similar study from Belgium, common rheumatic disorders were inflammatory joint and spine diseases (42%), soft-tissue rheumatism (37%), degenerative joint and spine diseases (36%), and metabolic bone diseases (17%) among 3751 patients with RDs. As this study was conducted in the rheumatology department of a referral hospital, the occurrence seems to be skewed toward inflammatory RDs. According to our study, 45% of RD patients had one or more comorbid condition; hypertension was the most frequent (24.3%), followed by hypothyroidism, DM, ILD, CAD, and asthma. Similar incidence was also noticed by Kudial et al., out of 130 women with rheumatologic symptoms, with hypertension being the commonest comorbidity followed by anemia, DM, and other conditions. In a study conducted by Mahajan et al. and Tandon and Mahajan, to study RD among rural population, hypertension, DM, dyslipidemia, anxiety, acid peptic disease, and anemia were the most common comorbid conditions., Similarly, in one of the studies conducted in Australia, Minaur et al., 2004, reported comorbid conditions as 58% overweight, 27% obese, 24% hypertensives, 12.5% diabetics, and 2% dyslipidemia. As observed in other studies, the majority of people suffering from RDs are elderly. However, there is a lack of similar studies in Indian patients with RDs as a whole. Chronic inflammatory diseases, including RDs, have been associated with increased arterial stiffness, which may subsequently lead to increased arterial BP and partly explain the high prevalence of hypertension in these patients. The present study also investigated the effect of age and BMI on comorbidities in patients with RDs. Applying the Chi-square analysis to our data, we found that RD and comorbidity increased significantly with age and BMI (P < 0.005), respectively. This may be due to the effects of disease activity. Several studies describe the association between high BMI categories and poorer clinical outcomes, a lower chance for remission, and a higher probability of comorbidity, but less radiographic joint damage. In our study, the increase in comorbidity was associated with increasing BMI, and the highest comorbidity was noted in patients with BMI <30. Similarly, Ajeganova S et al. concluded that obesity and central adiposity both at disease onset and during the course of the disease were associated with higher prevalence of comorbidities. In addition, BMI and obesity independently conferred to higher odds for being diagnosed with hypertension, DM, and chronic pulmonary disease. Various studies describe the association between high BMI categories and a higher probability of comorbidity. In our study, RA, SpA, OA, and SLE were the most frequently encountered RDs and therefore, these were considered further for the investigation of comorbidities. Among patients with RA, hypertension was the most common comorbidity followed by hypothyroidism, DM, ILD, and asthma. In a similar study that evaluated comorbidities in patients with RA in a hospital in Northeast India, majority of the patients with RA were anemic (66.67%) followed by infection (13.73%), thyroid disease (9.80%), renal disease (7.84%), osteoporosis (5.88%), CVD (5.88%), lung disease (5.88%), and vasculitis (1.96%). The commonly reported risk factor was hypertension (19.61%) followed by DM (9.80%) and dyslipidemia (7.84%). Metabolic syndrome was found in 39.28% of patients in the RA group; further higher prevalence of hypertension was noted in RA group than control group (41.66% vs. 25%) by Pandey et al., 2017. Among elderly patients with RA, 53.2% of the patients had one or more comorbidity at onset, the commonest being hypertension (27.3%), followed by obstructive pulmonary disease (13.9%), DM (8.0%), hypothyroidism (6.3%), and malignancy (5.0%). After 5 years, 41.0% had developed at least one new comorbidity, the most common being hypertension (15.1%), followed by malignancy (7.6%), stroke/transient ischemic accident (5.1%), myocardial infarction (4.3%), and osteoporosis (3.7%). A large spectrum of SpA cases have been reported in India. In our study, patients with SpA demonstrated the following comorbidities: hypertension was the most common followed by DM, hypothyroidism, and TB. In a study carried out in Indian subcontinent, 16.3% of SpA patients had uveitis. There is lack of data on comorbidities in SpA patients in India. In the recent ESPOIR and DESIR cohorts, 20.3% of patients with SpA had at least one comorbidity; the most common comorbidities were dyslipidemia (9.3%), hypertension (5.1%), and ulcer (4%). The prevalence of TB was significantly higher in patients with SpA (1.0% [0.4%–2.3%]) than in the general population. Nikiphorou et al. noticed at least one comorbidity in 51% of SpA patients; 9% had ≥3 comorbidities, which adversely influenced physical function, work ability, and quality of life, which are important factors to be taken into account in daily clinical practice. About 28.18% of patients with SpA were detected with the following comorbidities; peptic ulcer (20.91%), hypertension (20%), lung disease (15.45%), DM (13.64%), osteoporosis (10.91%), ischemic heart disease (10%), renal diseases (1.82%), and cancers (1.82%). In our study, patients with OA demonstrated the following comorbidities: hypertension, DM, hypothyroidism, and chronic kidney disease (CKD). Similar results were observed in a study conducted by Sancheti et al., 2017, at three hospitals in India. Approximately half of the patients with OA had a comorbid disease at the time of assessment (54.2%). 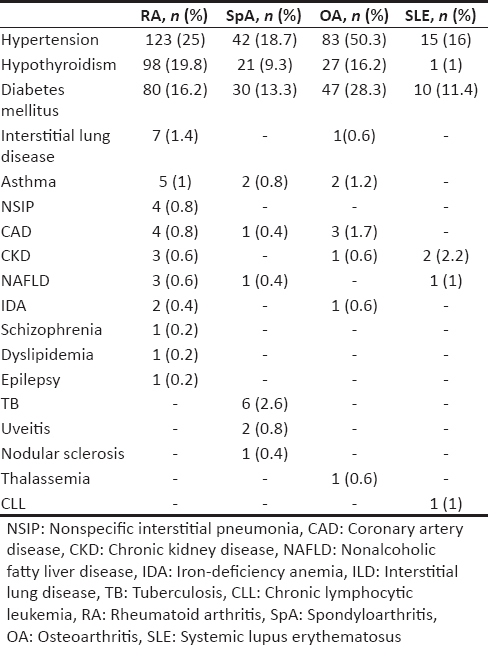 Common comorbidities included hypertension (40.8%), DM (24.4%), and osteoporosis (11.8%). Study results by Leite et al. showed a high frequency of comorbidities, such as metabolic syndrome (54.9%), hypertension (75.8%), dyslipidemia (52.6%), obesity (57.1%), DM, and depression, in the OA patients cared for at the Outpatient Clinic of Rheumatology of the Instituto de Medicina Integral Professor Fernando Figueira (IMIP). According to the CHECK study, more than 67% of the total study population with OA reported one or more comorbidity, with hypertension (20%) and back disorders (18%) to be the most prevalent. Further, the physical functioning and health status deteriorate with an increasing number of comorbidities. Previous studies have shown that comorbidities, such as visual disorders, DM, and CVD, not only occur more frequently than expected in OA patients, but also result in greater physical function impairment and adverse results for patients undergoing arthroplasty. In our study, patients with SLE demonstrated comorbidities such as hypertension, DM, CKD, hypothyroidism, chronic lymphocytic leukemia, and nonalcoholic fatty liver disease. Similarly, in other studies, hypertension was the most common comorbidity in these patients. In South African patients with SLE, the most frequent comorbidities were hypertension (43.5%), severe infections (29%), TB (15%), and HIV infection (9%). The most common comorbidities were high BP (33.7%), osteopenia/osteoporosis (22.2%), hypothyroidism (19.0%), DM (11.6%), and hypercholesterolemia (11.6%). Overall, high BP, DM, hypercholesterolemia, and CAD were more prevalent in SLE patients older than 54 years from Puerto Rico. In African-American and Hispanic ethnicities, SLE patients have an increased prevalence of hypertension (14%–75%). It is associated with subclinical atherosclerosis, CVD, and renal disease, which may be a major problem in approximately one-third of the patients. In a retrospective cohort study conducted in a UK population, people with SLE had a greater burden of comorbidity than people without SLE both before and after diagnosis and are more likely to develop CVD, stroke, end-stage renal failure, cancer, osteoporosis, and infection than people without SLE. A 6-year nationwide population-based study in Taiwan demonstrated that infection (86.36%) was the most common comorbidity in SLE. Other comorbidities were musculoskeletal diseases (16.7%), CVDs (16.37%), ocular diseases (10.73%), and renal diseases (6.75%). Patients with SLE had a higher risk of heart failure, hypertension, osteoporosis, cataracts, glaucoma, dyslipidemia, seizures, encephalopathy, and malignant changes, compared to non-SLE populations. The development of comorbidities was most frequent in the first 2 years of SLE diagnosis. Our study has some major limitation. First limitation is in the context of the study design, as this study was only hospital-based and perhaps van not be generalized at a community level. Secondly, the study also lacked data on patient follow-up and data on measures taken for the management of these comorbidities, which can further be addressed by longitudinally following up these patients. In our study, substantial proportions of patients with RDs, had comorbidities. The present study also found that RD and comorbidities increased significantly with age and BMI. Comorbidities should be detected and taken into consideration as part of RD management. Early detection of associated comorbid conditions is helpful for efficient management of RD. Damjanov N. Comorbidity in Rheumatic Diseases. SP0151. EULAR; 2014. Richard AW. Comorbidities of Rheumatic Disease. Oxford Textbook of Rheumatology. 4th ed. Oxford University Press; 2015. DOI: 10.1093/med/9780199642489.001.0001. Gabriel SE, Michaud K. Epidemiological studies in incidence, prevalence, mortality, and comorbidity of the rheumatic diseases. Arthritis Res Ther 2009;11:229. Al-Bishri J, Attar S, Bassuni N, Al-Nofaiey Y, Qutbuddeen H, Al-Harthi S, et al. Comorbidity profile among patients with rheumatoid arthritis and the impact on prescriptions trend. Clin Med Insights Arthritis Musculoskelet Disord 2013;6:11-8. Ranganath VK, Maranian P, Elashoff DA, Woodworth T, Khanna D, Hahn T, et al. Comorbidities are associated with poorer outcomes in community patients with rheumatoid arthritis. Rheumatology (Oxford) 2013;52:1809-17. Kerola A. Epidemiology of Comorbidities in Early Rheumatoid Arthritis with Emphasis on Cardiovascular Disease. Available from: http://www.hdl.handle.net/10138/153874. [Last accessed on 2018 Jul 09]. Huscher D, Sengler C, Gromnica-Ihle E, Bischoff S, Eidner T, Ochs W, et al. Clinical presentation, burden of disease and treatment in young-onset and late-onset rheumatoid arthritis: A matched-pairs analysis taking age and disease duration into account. Clin Exp Rheumatol 2013;31:256-62. Dougados M, Soubrier M, Antunez A, Balint P, Balsa A, Buch MH, et al. Prevalence of comorbidities in rheumatoid arthritis and evaluation of their monitoring: Results of an international, cross-sectional study (COMORA). Ann Rheum Dis 2014;73:62-8. Pandey PK, Swami A, Biswas TK, Thakuria R. Prevalence of metabolic syndrome in treatment naïve rheumatoid arthritis and correlation with disease parameters. Arch Rheumatol 2017;32:46-52. Handa R, Rao UR, Lewis JF, Rambhad G, Shiff S, Ghia CJ, et al. Literature review of rheumatoid arthritis in India. Int J Rheum Dis 2016;19:440-51. Kar N. A short communication on occurrence of rheumatic diseases attending hospital. Indian J Public Health 1994;38:115-8. Oguntona SA, Edunjobi AS, Olatunde AO. Prevalence of rheumatic diseases in a rheumatology outpatient practice of a tertiary hospital. Int Res J Med Biomed Sci 2016;1:11-8. Vanhoof J, Declerck K, Geusens P. Prevalence of rheumatic diseases in a rheumatological outpatient practice. Ann Rheum Dis 2002;61:453-5. Kudial S, Tandon VR, Mahajan A. Rheumatological disorder (RD) in Indian women above 40 years of age: A cross-sectional WHO-ILAR-COPCORD-based survey. J Midlife Health 2015;6:76-80. Mahajan A, Jasrotia DS, Manhas AS, Jamwal SS. Prevalence of major rheumatic disorders in urban population in Jammu. JK Sci 2003;5:63-6. Tandon VR, Mahajan A. Rheumatic disorders – A rural experience. JK Sci 2007;9:160. Minaur N, Sawyers S, Parker J, Darmawan J. Rheumatic disease in an Australian aboriginal community in North Queensland, Australia. A WHO-ILAR COPCORD survey. J Rheumatol 2004;31:965-72. Burmester GR, Ferraccioli G, Flipo RM, Monteagudo-Sáez I, Unnebrink K, Kary S, et al. Clinical remission and/or minimal disease activity in patients receiving adalimumab treatment in a multinational, open-label, twelve-week study. Arthritis Rheum 2008;59:32-41. Sokka T, Mäkinen H, Hannonen P, Pincus T. Most people over age 50 in the general population do not meet ACR remission criteria or OMERACT minimal disease activity criteria for rheumatoid arthritis. Rheumatology (Oxford) 2007;46:1020-3. Treharne GJ, Douglas KM, Iwaszko J, Panoulas VF, Hale ED, Mitton DL, et al. Polypharmacy among people with rheumatoid arthritis: The role of age, disease duration and comorbidity. Musculoskeletal Care 2007;5:175-90. Westhoff G, Weber C, Zink A. Comorbidity in rheumatoid arthritis of early onset. Effects on outcome parameters. Z Rheumatol 2006;65:487-8, 490-4, 496. Albrecht K, Richter A, Callhoff J, Huscher D, Schett G, Strangfeld A, et al. Body mass index distribution in rheumatoid arthritis: A collaborative analysis from three large German rheumatoid arthritis databases. Arthritis Res Ther 2016;18:149. Ajeganova S, Andersson ML, Hafström I; BARFOT Study Group. Association of obesity with worse disease severity in rheumatoid arthritis as well as with comorbidities: A long-term followup from disease onset. Arthritis Care Res (Hoboken) 2013;65:78-87. Singh S, Lihte RJ, Baruah C, Lahkar M, Singh PK. A pilot study of comorbidities in patients with rheumatoid arthritis at a tertiary care hospital in Northeast India. Biomed Res Ther 2016;3:454-9. Innala L, Sjöberg C, Möller B, Ljung L, Smedby T, Södergren A, et al. Co-morbidity in patients with early rheumatoid arthritis – Inflammation matters. Arthritis Res Ther 2016;18:33. Ninan F, Mathew J, Phiilip SS, John D, Danda D, John SS. Uveitis of spondyloarthritis in Indian subcontinent: A cross sectional study. Int J Adv Med 2017;4:1441-6. Gherghe AM, Dougados M, Combe B, Landewé R, Mihai C, Berenbaum F, et al. Cardiovascular and selected comorbidities in early arthritis and early spondyloarthritis, a comparative study: Results from the ESPOIR and DESIR cohorts. RMD Open 2015;1:e000128. Nikiphorou E, Ramiro S, van der Heijde D, Norton S, Moltó A, Dougados M, et al. Association of comorbidities in spondyloarthritis with poor function, work disability, and quality of life: Results from the assessment of SpondyloArthritis International Society Comorbidities in Spondyloarthritis study. Arthritis Care Res (Hoboken) 2018;70:1257-62. Leite AA, Costa AJ, Lima Bde A, Padilha AV, Albuquerque EC, Marques CD, et al. Comorbidities in patients with osteoarthritis: Frequency and impact on pain and physical function. Rev Bras Reumatol 2011;51:118-23. Sancheti P, Shetty VD, Dhillon MS, Sprague SA, Bhandari M. India-based knee osteoarthritis evaluation (iKare): A multi-centre cross-sectional study on the management of knee pain and early osteoarthritis in India. Clin Orthop Surg 2017;9:286-94. Wesseling J, Welsing PM, Bierma-Zeinstra SM, Dekker J, Gorter KJ, Kloppenburg M, et al. Impact of self-reported comorbidity on physical and mental health status in early symptomatic osteoarthritis: The CHECK (Cohort hip and cohort knee) study. Rheumatology (Oxford) 2013;52:180-8. Sonia L. Comorbidities in South Africans with Systemic Lupus Erythematosus. Available from: http://www.wiredspace.wits.ac.za/handle/10539/23170. [Last accessed on 2018 Mar 28]. Molina MJ, Mayor AM, Franco AE, Morell CA, López MA, Vilá LM, et al. Prevalence of systemic lupus erythematosus and associated comorbidities in Puerto Rico. J Clin Rheumatol 2007;13:202-4. Chaiamnuay S, Bertoli AM, Roseman JM, McGwin G, Apte M, Durán S, et al. African-American and Hispanic ethnicities, renal involvement and obesity predispose to hypertension in systemic lupus erythematosus: Results from LUMINA, a multiethnic cohort (LUMINAXLV). Ann Rheum Dis 2007;66:618-22. Rees F, Doherty M, Grainge M, Lanyon P, Davenport G, Zhang W. The Burden of Comorbidity in Systemic Lupus Erythematosus. Rheumatology 2015;54:i166. Chan PC, Yu CH, Yeh KW, Horng JT, Huang JL. Comorbidities of pediatric systemic lupus erythematosus: A 6-year nationwide population-based study. J Microbiol Immunol Infect 2016;49:257-63.